Parking: Private parking is possible at a location nearby (reservation needed – additional charge of 20€ per day payable locally). 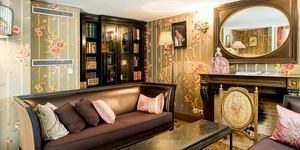 Located in a lovely building dating back to the 19th Century, this charming boutique hotel offers a true Parisian welcome with friendly and caring staff as well as a traditional French style. Perfectly located in the 8th Arrondissement, the hotel is just a stone’s throw away form the iconic Avenue des Champs-Elysées. You can reach the Arc de Triomphe by foot in just five minutes. The closest metro station, George V, is just over 300m away and provides an easy access to the main sights of the city such as the Louvre or the Marais district. A delicious breakfast is served every morning with fresh local products in the hotel’s breakfast room. A lounge bar is also available for guests to relax after a long day of sightseeing. Massages are available upon request. 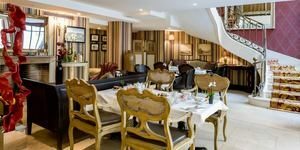 The hotel has a friendly and helpful staff which can help guests arrange bicycle rental, car rental, airport transfer as well as providing packed lunches if required. The 28 rooms are decorated in a classic French style. 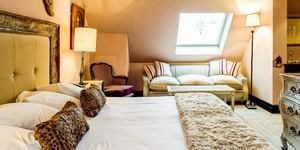 Each room boasts a Satellite TV, individual climate control, a mini-bar, complimentary WIFI, as well as en-suite bathrooms with decadent toiletries. Room grade include Classic rooms, Superior rooms and Deluxe rooms.